Candidates Donald Trump and Hillary Clinton campaign the day after their second debate. Rhetoric on the U.S. presidential campaign trail has left many in the Asia-Pacific region wondering whether America’s commitment to economic growth and security in the region will survive into another presidency, regardless of who wins. In a campaign marked by caustic, tawdry and highly personal remarks, one candidate has threatened to withdraw the U.S. nuclear umbrella that protects countries like South Korea and Japan, while both have opposed a landmark trade deal seen as the linchpin of the region’s future prosperity. The campaign “has really undermined the faith and the convictions that many regional actors have about the viability of American commitments [and] the stability of our own democracy,” said Jonathan Pollack of the Brookings Institution’s Center for East Asia Policy Studies. American leaders are necessarily preoccupied by the high-profile conflicts in the Middle East and the threat to the homeland posed by Islamist terrorists. But analysts point to looming threats in the Asia-Pacific, a region that accounts for almost 40 percent of world output, according to the International Monetary Fund. 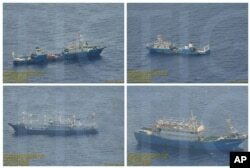 North Korea has ramped up nuclear and missile tests in the Korean Peninsula, tensions have mounted over China’s territorial claims and aggressive actions in the South China Sea, and the new president of longtime ally the Philippines has vowed to “break up with America” and turn to China and Russia. Both former president George W. Bush and President Barack Obama worked to open diplomatic, security and economic channels in a bid to cement America as a leader in the Asia-Pacific, where China is rapidly amassing power and influence. U.S. military assets in the region have been growing since Obama promised a “pivot to Asia” early in his presidency. However, statements by Republican presidential nominee Donald Trump and Democratic presidential nominee Hillary Clinton have left many in the region wondering whether that commitment will continue. Trump, in particular, has alarmed long-time allies by suggesting that he would no longer guarantee the defense of South Korea and Japan unless those countries contributed more to the cost. He has also vowed to kill off the 12-nation Trans-Pacific Partnership, a ground-breaking trade treaty designed to open markets around the Pacific Rim. There is “fear and loathing” in the Asia Pacific about a potential Trump presidency, said Robert Manning of the Atlantic Council's Brent Scowcroft Center on International Security. This feeling, Manning added, comes even though there is “not enough coherence to Trump’s comments” to be certain what he might do once in office. Clinton would be expected to continue the Obama administration’s strategic rebalance, but she has been emphatic in her rejection of the TPP, which is opposed by unions and blue-collar workers whose support she needs. Without an economic commitment in the region like TPP, U.S. credibility is lost, experts say. During an economic address two months ago in Warren, Michigan, Clinton said of TPP: “I oppose it now. I’ll oppose it after the election, and I’ll oppose it as president.” She had previously expressed support for the trade partnership. An adviser on Asian issues who worked with Clinton at the State Department gave a similarly nuanced description of her position during a discussion at the Korea Economic Institute in Washington. However it is Trump’s comments on regional security that are causing the greatest anxiety. 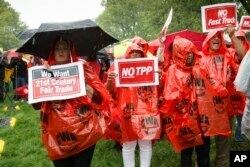 FILE - Demonstrators rally for fair trade at the Capitol in Washington. During an August rally in Des Moines, Iowa, he expressed frustration about Japan, one of America’s closest allies. He told supporters Japan cannot help if the U.S. is attacked because its constitution bars overseas military action. The Pacific nations in fact contribute significantly to regional defense, particularly against the threat posed by North Korea. Japan pays $1.6 billion a year in host-nation support for U.S. military operations in Japan, and South Korea pays almost $1 billion for the same reason. "It's time to go back and start from ground zero and do a full assessment of what our strategy needs to be to confront the challenges that are out there,” Hoekstra said during the discussion at the Korea Economic Institute. “It doesn't mean to ... challenge the relationships or the friendships that we have in Asia." 2016 Election Issues: To Trade or Not to Trade?